Nothing protects like a full-sleeved jacket, and nothing breathes like mesh. So if you want all-day comfort in the heat of the summer without sacrificing coverage, a mesh jacket is an obvious choice. 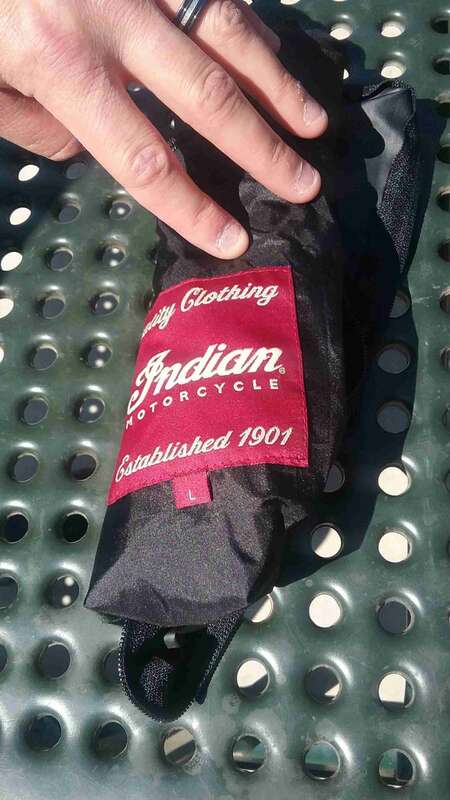 Indian Motorcycle offers just the thing, the Indian Shadow Mesh Jacket. It’s a stunningly stylish garment of simple design, modern but with classic lines. It’s also offered a price point that puts it squarely in competition with most other textile jackets. 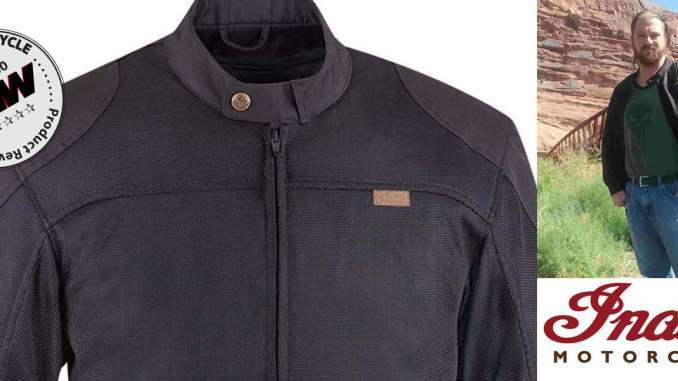 Total Motorcycle spent four weeks with this jacket, and we’re excited to tell you how it fared. The first thing you notice about the Indian Shadow Mesh Jacket is the color. It. Is. BLACK. Limousine black, tuxedo black, whatever you want to call it. And with the exception of the antique brass snaps at the collar, the zipper pulls, and the ½” x 1 ¼” leather Indian logo on the left breast, it’s ALL black on the outside. No highlights in the stitching, no panels of different colors, just black from top to bottom. Inside, two red patches bear the Indian logo, one of which isn’t visible with the liner zipped in. This is a mesh jacket though, so it’s also inexplicably see-through. Except for the textile panels at the pockets, shoulders, back and elbows, it’s transparent in good light. Not while you’re wearing it of course, even light-colored clothes don’t show through the mesh. But a strong enough light source will set it to shimmering like black chain mail or carbon fiber. The cut is classic, iconic, and unpretentious. No lapels, a straight banded collar, brass hardware, quilted bands in the lumbar area. Fabric welts conceal the zippers and pulls, if you’re industrious enough to tuck them in the groove. Embossed leather Indian emblems adorn the right bicep and the back of the neck, minimalist and understated. The only other nod to the brand is, as mentioned, a small tanned leather tag on the left breast and the patches inside. At fifteen paces, you couldn’t make out an Indian logo if you wanted to. 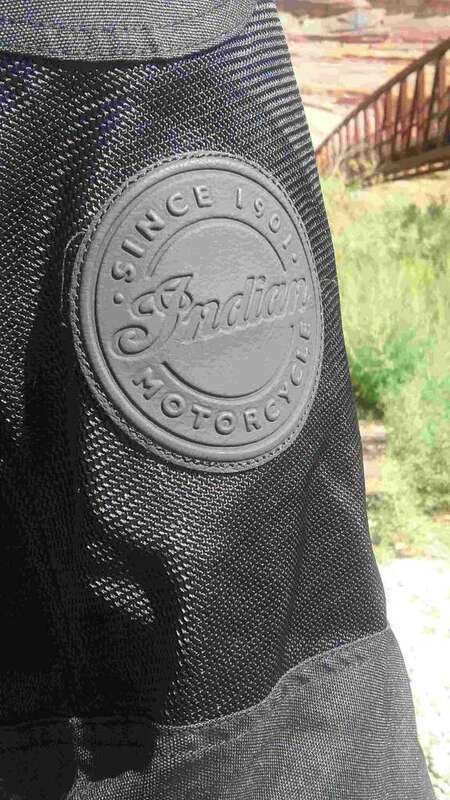 The Indian logo on the Shadow Mesh Jacket is iconic, yet covert. The overall effect is slightly menacing without being aggressive, sleek and modern but with classic lines. The Indian Shadow Mesh Jacket would look natural on any style of bike and any build of rider. It would also complement any outfit, whether you were wearing it over an Affliction tee-shirt at bike night or an Izod button-down at morning staff meeting. For the “V-Twin” fit, at least, Indian sizes run large. I ordered my Indian Shadow Mesh Jacket in the same size I order all my jackets, a Large, and it’s slightly big on me. Not overtly so, the cuffs fall right where they should and it doesn’t billow when I’m riding, but I could have got away with a Medium. I appreciate the slack, though. There’s plenty of room to layer a thermal base and tee for cold riding, or to conceal an underarm rig. The fabric is heavy and substantial, so it falls straight without bunching. Zipped expanders on the flanks offer a couple extra inches for the ride home from the buffet. The cuffs stay put better than any jacket I’ve ever worn, even at 100+ miles per hour, and they’re two-snaps adjustable. Finally, the wind and waterproof liner is thin enough that it doesn’t interfere with fit in any way, in or out. Sleek, modern, and comfortable, the Shadow Mesh Jacket makes no compromises. This is the most impressive part of the Indian Shadow Mesh Jacket. I’ve owned half a dozen riding jackets, and one thing they’ve had in common was some level of discomfort. One jacket, I had to cut a swatch from a sock and stick it to the Velcro collar to prevent it rubbing painfully against my jaw. Another, the closure for the elbow armor scratched every time I moved my arm. Rigid stitches, poorly surged pockets, substandard fabrics and burred hardware all conspire to create an iron maiden of irritation in all my other jackets. Not the Indian, though. The banded collar is buttery smooth, with a beveled cap on the inside of the snap. The armor pouches Velcro shut without any overlap, so there’s never a rough tooth against your skin. They’ve tucked everything away and buttoned it up, and it’s smooth and clean and just comfy inside. I’ve ridden 2000+ miles in it, and this jacket has never once drawn attention to itself by bunching, pinching or pulling. Have you ever decided which jacket to wear based on how recently you’ve shaved? Then you know what I’m talking about. Finally, the mesh makes for an incredibly comfortable ride when the temperature climbs. The breeze keeps you dry and cool, almost like riding in a vest, but without the sunburn. 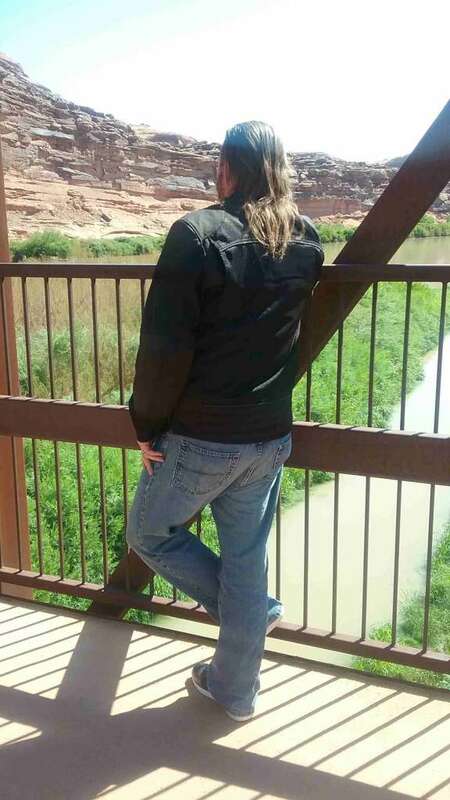 Without the liner in place, the Indian Shadow Mesh Jacket kept me cool and comfortable in 100+ degree weather. That’s both while riding through remote country and while puttering from stoplight to stoplight in downtown rush hour traffic. With the liner in, I have ridden in temperatures as cool as 55 degrees without getting uncomfortable. I’d test it in even lower temps, but in northern Utah in August and September that’s about as cool as it gets. I would feel confident wearing this jacket with liner down to 50 degrees, provided it wouldn’t stay that cool the entire trip. The primary function of any jacket is to save your hide in the event of a fall, that’s just chapter and verse. And while I consider myself a dedicated reviewer, dropping my bike to test that function of a jacket just isn’t in my repertoire. 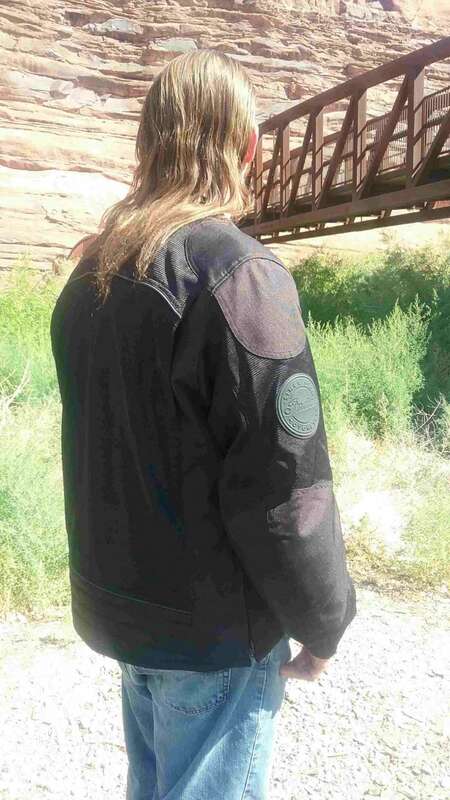 The Indian Shadow Mesh Jacket has CE-2 armor at the elbows and shoulders, and they stay where they’re supposed to. There’s no armor out back, but there are quilted bands in the lumbar region that feel very durable. There’s also a heavy double stitched band with leather piping across the shoulders that feels like it could absorb some road rash, but whether it’s there for that purpose or just a style element I wouldn’t hazard a guess. Secondary to protecting you in a fall, a jacket should protect you from the elements and road debris. 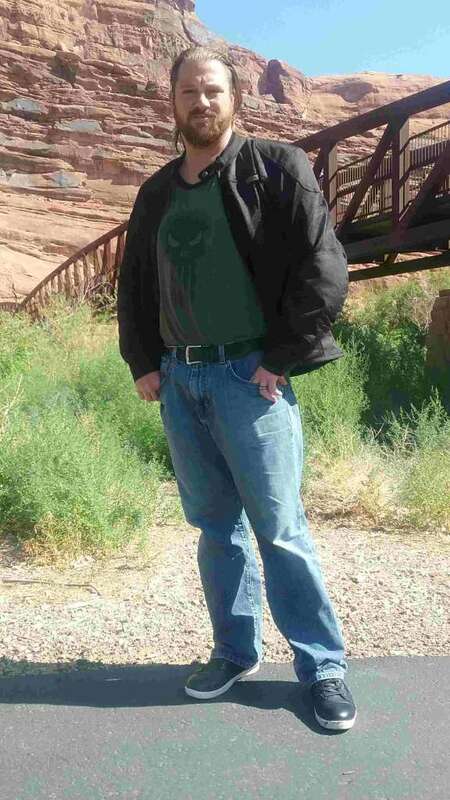 This jacket does those things very well, and that’s a function I tested relentlessly. 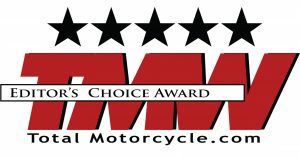 I rode more than 2000 miles in the four weeks I spent reviewing it, and it hasn’t disappointed. I’ve taken the customary peppering of pebbles and insects without a mark, and for the first time I can remember I stayed cool and didn’t have a sunburn the next day. I know that sounds a little silly, like a throwaway comment, but it’s really more than that. I know better, but I “dress for the ride” more often than I “dress for the slide”. Until now, I’ve done most of my summer riding in a sleeveless vest, or a jacket with zip-off sleeves. With this jacket, I feel like I can protect myself against a possible down while still staying cool and comfortable. Having that option makes it easier to make the smarter decision, and that’s a value beyond measure. A couple more notes about the liner. First, it’s not quilted fabric like you’re probably used to. This liner is more like plastic or vinyl on the outside, while the inside is smooth, thin fabric. Heat-fused adhesive strips seal the stitching for waterproofing. Besides truly cold temperatures, the only other condition I haven’t got to test this jacket in was rain. As such, I can’t speak to the waterproofing, but it seems like it would do an excellent job of blocking the rain. This thin construction makes it extremely portable as well. The liner can fold or roll down to the size of an emergency rain poncho, which means it can come with you. Most of my other zip-out liners spend all their time on a hanger at home when I’m not using them. The water and windproof liner rolls up small enough to take with you, even when you’re packing light! The other interesting characteristic of the liner is how it attaches to the jacket. The back zippers in like you’d expect, but the sleeves are unique. My other liners all have a tethered button or snap somewhere in the cuff for securing it to the shell. On the Indian Shadow Mesh Jacket, the cuffs of the liner and shell zipper together for a secure, seamless fit. This requires pulling the cuffs inside out to get at the zipper, but it’s a simple procedure. For storage, the Indian Shadow Mesh Jacket features four pockets. On the exterior it has two side pockets with zippered closures, both roomy enough for fairly large items. The inside of the actual jacket also has a Velcro pocket low on the left side, large enough for a full-sized smartphone, vaping rig or pack of cigarettes. With the liner in place though, that pocket becomes a little difficult to get to. To make up for it, the liner has a Velcro pocket on the right side that’s about 3/4 the size of the pocket it obscures. The Indian logo is handsome, made of finely tooled leather. With the Shadow Mesh Jacket, Indian has created a very strong contender in the textile jacket segment. This jacket is all-day comfortable and all-night stylish. It will not raise any eyebrows in the board room, but with CE-2 armor and long sleeves the ATGATT crowd would have a hard time condemning it. The liner offers some flexibility for temperatures and weather, and is portable enough to carry with you. As mentioned above, this jacket also strikes a balance between comfort and safety that’s hard to come by. All this at a competitive price point for a textile. For what it is and what it does, this jacket is simply superb. 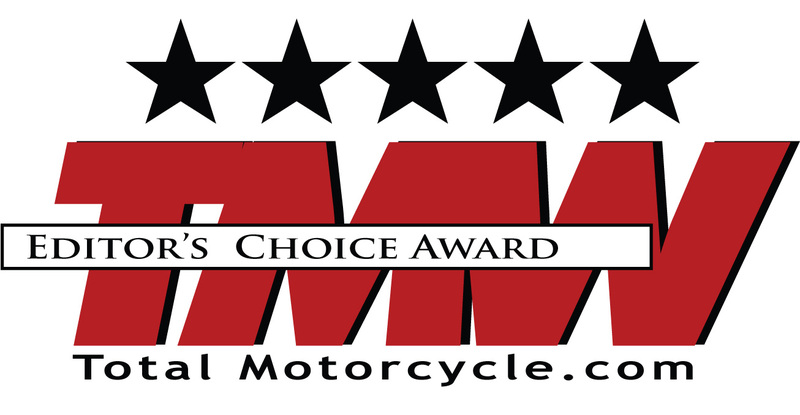 We’re elated to award the Shadow Mesh Jacket from Indian our coveted Editor’s Choice Award, five stars!